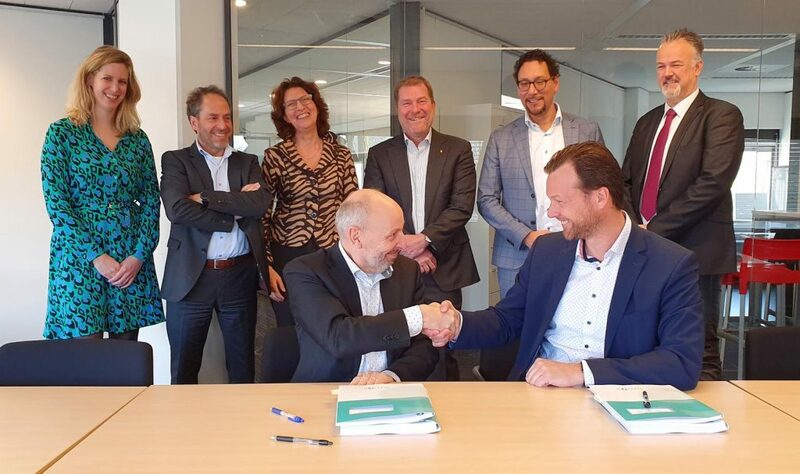 At the beginning of April 2019, during a festive moment at the office of the Nidos Foundation in Utrecht, we signed a 4-year contract for the delivery and implementation of Axxerion software. Nidos carries out youth protection (guardianship) for minor refugees. These children, called pupils by Nidos, arrived in the Netherlands alone or accompanied by their families. Nidos guides the pupils to a self-reliant existence until they reach the age of 18. To the extent possible, foster families take in the refugees. Nidos launched a tender procedure in November 2018 to replace the self-built systems PRS (Pupil Registration System), EPD (Electronic Pupil File), EGD (Electronic Family File) and Portal. The organization started this initiative given that these primary systems were no longer able to support the work processes properly. Moreover, there was a lack of integration with the functionality of Exact and ADP software packages. An important objective for the new software is that it enables an integrated approach, so as to obtain an integral insight into the pupil’s situation and the identification of critical process indicators. Furthermore, it is essential that the system offers users the flexibility to modify workflows and authorizations. Finally, it must be easy to generate management, policy and accountability information. Nidos consulted different market parties by means of a Request for Information. After examination, it decided to award the contract on a European scale by means of a public tender procedure. Eventually Nidos opted for the Axxerion software, which offered the best price-quality ratio. Nidos also sought a partner with affinity for the target group and the youth protection work that Nidos does. During our demonstration we were able to convince the assessment committee of our acquaintance with youth care. Spacewell supports the vision of Nidos that every pupil should be raised and supported with respect, safety and protection in mind. We hope that our software can contribute to the development of vulnerable minors into independent adults. Nidos is the only certified institution designated by the Dutch Ministry of Justice and Security that carries out supervision for refugee children. The organization is the guardian for approximately 4,000 pupils who are accompanied by 350 youth protectors. Nidos’ counselling includes legal, cultural, psychological and social aspects. In total, Nidos has about 500 employees who are organized regionally. The 13 regions carry out the mission based on the centrally established processes. Spacewell, part of the publicly-traded Nemetschek Group, is a technology and consulting company that helps its customers improve the performance of facilities and processes. Our main goal is to make buildings work harder for their users by collecting and processing building data. Spacewell (formerly MCS Solutions, Axxerion and Plandatis) was founded in 1989 in Antwerp. It currently employs 300 people in 10 locations.